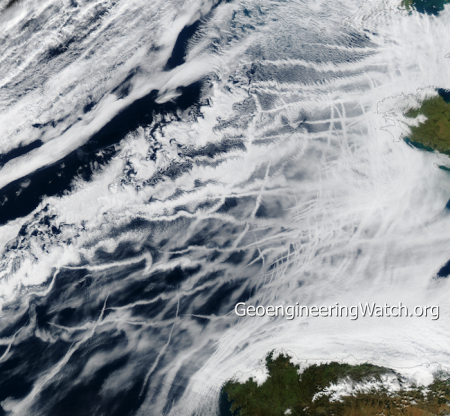 NASA tells us that the shockingly visible and very extensive “tracks” (or trails) being witnessed on satellite imagery over oceans (like the ones shown below) are ALL the result of pollution being produced by ships, which is in turn creating “clouds”. Is it rational to fully accept the “ship tracks” explanation from NASA as the ONLY source of the trails we so clearly see in the following images? NASA, of course, does not in any way acknowledge the ongoing geoengineering / solar radiation management jet aircraft dispersions. We must consider and remember that any method of delivering toxic particles into the atmosphere (ship despersions or jet aircraft despersions) are forms of climate engineering / intervention which are inflicting immense damage to the overall life support systems of the planet. 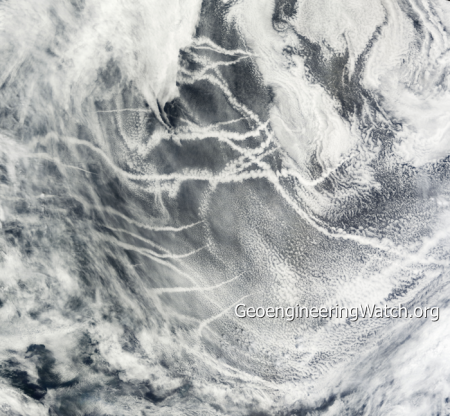 In the startling photograph above, nearly the entire Eastern Pacific is covered with a blanket of atmospheric haze and what NASA exclusively labels as ”ship tracks”. In reality, NASA is nothing more than a military industrial complex contractor for the power structure, deceiving the public has always been a major part of this agency’s mission. 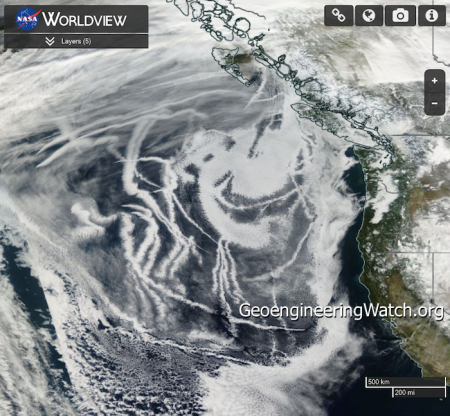 Let’s consider NASA’s official position on geoengineering (or “chemtrails”), NASA, NOAA, NWS, and the USAF tell us the relentless bombardment of atmospheric particulate spraying in our skies is all just “contrails”. Is this explanation in any way credible? If the design characteristics of the modern high bypass turbofan jet engine are taken into account, NASA’s official “just contrails” narrative can be seen for what it is, total deception. Below is a satellite animation loop that clearly reveals numerous extremely long trails (some well over 500 miles in length) covering much of the Eastern Pacific off of the west coast of North America. 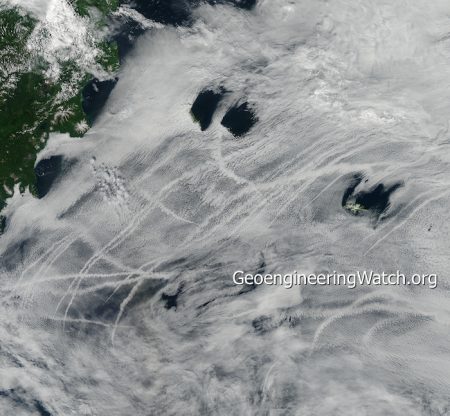 NASA tells us these are ALL just “ship tracks” from ship engine combustion exhaust created by standard commercial shipping vessels, but is this official explanation reasonable in all cases? First, with the extreme volume of shipping traffic operating in the Eastern Pacific, why would only a select percentage of ships leave such long and blatantly visible ”tracks”? 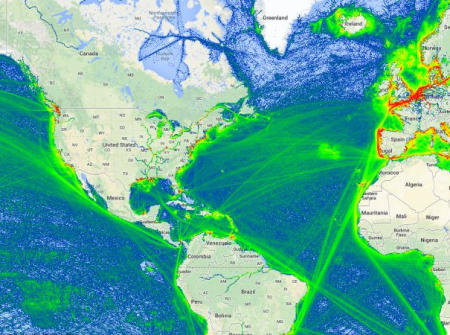 Next, why would shipping companies (that are extremely cost conscious of the staggering amount of fuel their ships consume) allow their vessels to meander over the oceans in sometimes haphazard patterns and directions? Some of the largest ships can burn nearly 400 tons of fuel per day, their primary objective is to take the shortest possible routes for obvious economic reasons. Why would a commercial ship plot a course along some of the “ship track” trajectories we see on satellite images? (Wind movement / drift of “tracks” cannot account for many of the observed trail directional anomalies). The image below reflects marine shipping lane traffic. The objective of shipping vessel traffic is to get from port to port by the shortest most direct route possible as the graphic above clearly reflects. 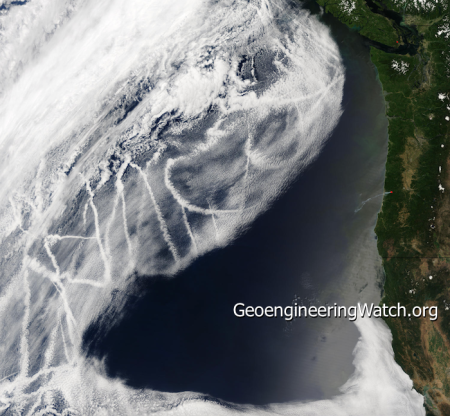 The clustering and grid pattern like formations (of what we are officially told is just naturally occurring ”ship tracks” due to combustion engine exhaust) should cause any objective and analytical individual to take pause regarding the official narrative on this phenomenon. When we can say with certainty that top military commanders have long since considered the disintegrating climate system to be the top national security threat, and when we know that “marine cloud brightening” is a primary form of “proposed” climate engineering, it is reasonable to conclude this form of planetary geoengineering is exactly what we are witnessing. But, the remaining question is still this, are all the “trails / tracks” we are seeing over the oceans exclusively from ships as NASA would have us believe? Or are many of the long uniform “trails / tracks actually aircraft dispersions just as we see over land? Let’s again consider that many of the “ship tracks” we see on radar remain fairly uniform in width for distances of 500 to 600 miles and even more. When we take into account the mathematics of this equation, the “ship tracks” narrative becomes questionable at best in numerous cases. Many of the largest container ships are now traveling at speeds as low as 12 knots in order to reduce fuel consumption. At this speed, some of the longest “tracks” we see in satellite images could take 2 to 3 days to lay out. Are we to believe that such long and uniform “tracks” would remain in tact for up to several days? Especially if the source of the atmospheric particle dispersion occurred at sea level from the smoke stack of a slow moving ship? Geoengineering particulate dispersions from jet aircraft can spread out and cover the skyline in time frames of an hour or less. Why would we believe the “ship tracks” hold a uniform shape for so long over distances of up to 500 or 600 miles or more? 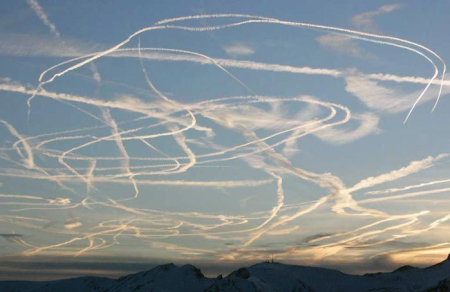 Below is a shocking photo of what NASA would have us believe is just “condensation trails” from normal air traffic. Would any rational person accept such a blatant and glaring official lie? 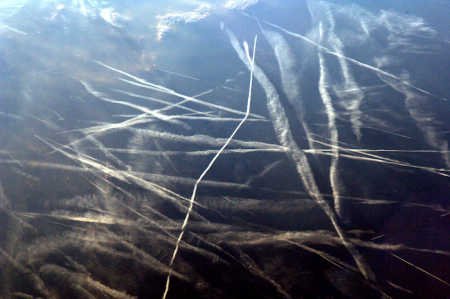 Populations around the globe have so far, unfortunately, accepted the “commercial air traffic condensation trail” official lie that is fed to them by agencies and the vast majority of government sponsored academia. The jet aircraft particulate dispersion trails in the photo above are similar in size and length to what NASA says are just “ship tracks” over the oceans. 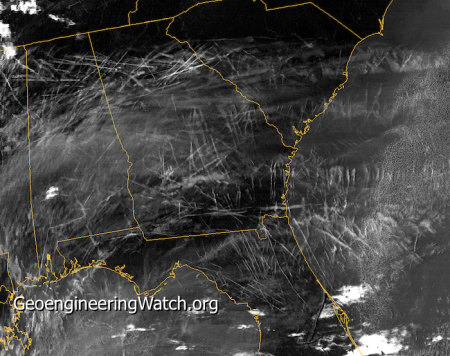 Let’s consider the satellite image of the south eastern US shown above, the jet dispersed particulate trails over land clearly match those over te oceans. 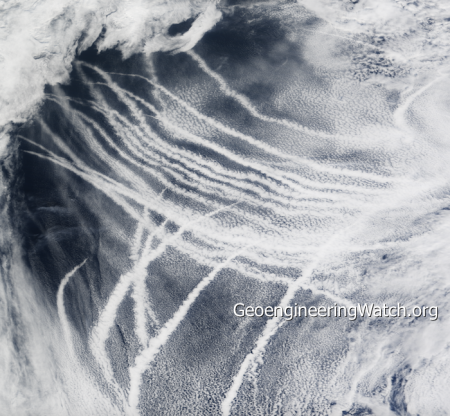 Since these are, of course, jet sprayed particulate trails over the continental US (and not “ship tracks”), are we seeing jet aircraft sprayed dispersions over the oceans in this image? If the latter is true, why are there no “ship tracks” on this day along the whole of the US east coast? We must all thoroughly examine all available facts before coming to conclusions. Global dimming is an undisputed ongoing scenario on our planet and is a direct result of atmospheric particulate loading (the exact goal of climate engineering / solar radiation management). Low altitude jet aircraft particulate dispersions / spraying can be clearly seen over the oceans from shoreline locations on days with the conducive conditions for such observations. Marine cloud brightening is one of many known objectives of the climate engineering criminal cabal (as is ocean fertilization). The over the ocean operations are likely being carried out with both jet aircraft and sea surface vessels (all such operations are, of course, highly toxic and of grave concern). There is a mountain of data to confirm that global climate engineering has long since been a lethal reality. This data includes patents, government documents, inarguable film footage of jet aircraft spraying, and countless photographs of ongoing atmospheric aerosol spraying operations. There is also the on the record dire climate disintegration concerns of military leaders which are well known (and have long since been publicized). Why wouldn’t any rational person conclude the obvious? Climate engineering has long since been fully deployed all over the world. The climate scientist community (and corporate media) betrayal of the truth (for a paycheck and a pension) is a primary reason that the “condensation trail” lie persists and thus the public largely remains oblivious to the ongoing climate engineering operations. Illegal federal gag orders on all NWS and NOAA employees is another major factor in the ongoing climate engineering cover-up. 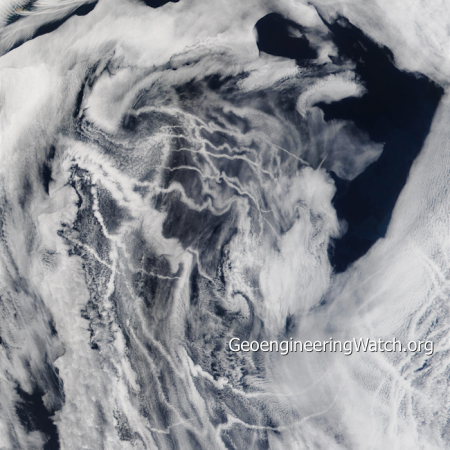 The ardent denial of geoengineering by some climate scientists can only be considered extremely fanatical and alarming. What are they being threatened with? What is the bottom line with the climate science communities conclusions about climate engineering (when asked to state their opinion ON THE RECORD)? A recent survey of nearly 1500 scientists by the “Legal Alliance to Stop Geoengineering” (LASG) was very revealing. Not one of this massive number of academicians was willing to deny climate engineering on the record, not one. The ongoing climate engineering insanity is mathematically the most destructive form of anthropogenic activity yet inflicted on our once thriving planet. Every single awake and aware individual is desperately needed in the critical battle to expose and halt climate engineering, reaching a critical mass of awareness is the only way forward.